Club members visiting with each other and flying while spectators watch. The Board of Directors of the Casa Grande RC Flyer recently held a lunch meeting in the Tack Room at Robson Ranch and discussed the future plans for the club. 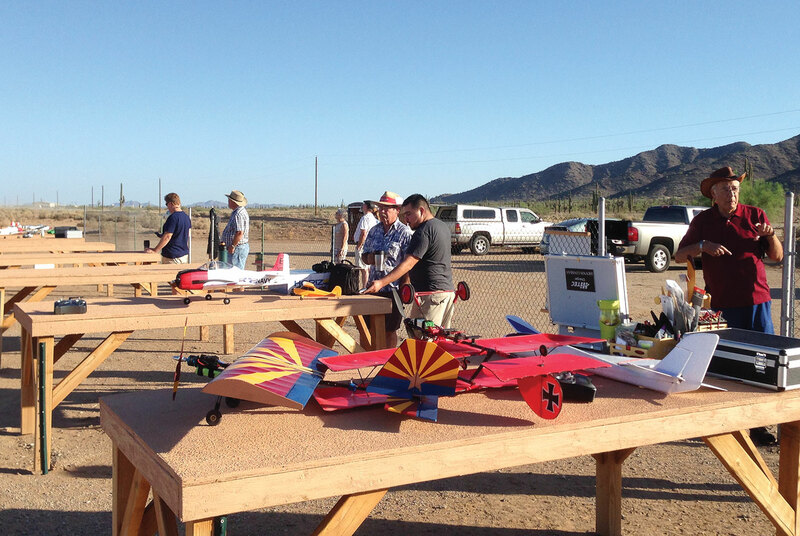 As the only Academy Of Model Aeronautics (AMA) sanctioned club within 35 miles of Robson Ranch, the Casa Grande RC Flyers is responsible for promoting interest in model aircraft flight in this area of the valley. The main item discussed was the holding of air shows and other events during the next winter season. Air shows would interest the public and promote the hobby. Expert pilots would be recruited to display their skills with both fixed wing aircraft and helicopters. Their stunts would be breathtaking. The events would benefit local charities. Also discussed was a change in food service at the field at club events to include a more extensive menu for both breakfast and lunch items. Finally the club is looking to increase the size of its board from four to five members and add club officers for both field safety and community service projects. Club members can fly and use the field any day they desire; however, those looking for the company of fellow flyers tend to fly on Saturday mornings over the summer months. Because of the heat, flying usually starts about one hour after sunrise and finishes two hours later on most Saturdays. Visitors are welcome to watch the pilots fly all kinds of model aircraft including helicopters, sailplanes, jets, biplanes and regular fixed wing models. The club members also enjoy answering questions from visiting guests. There are benches at the club field, free parking and toilet facilities. The Casa Grande RC Flyers Club and its flying field should not be confused with the flying area located within Robson Ranch. Directions to the Casa Grande RC Flyers field are found on the club website at www.CasaGrandeRCFlyers.com. 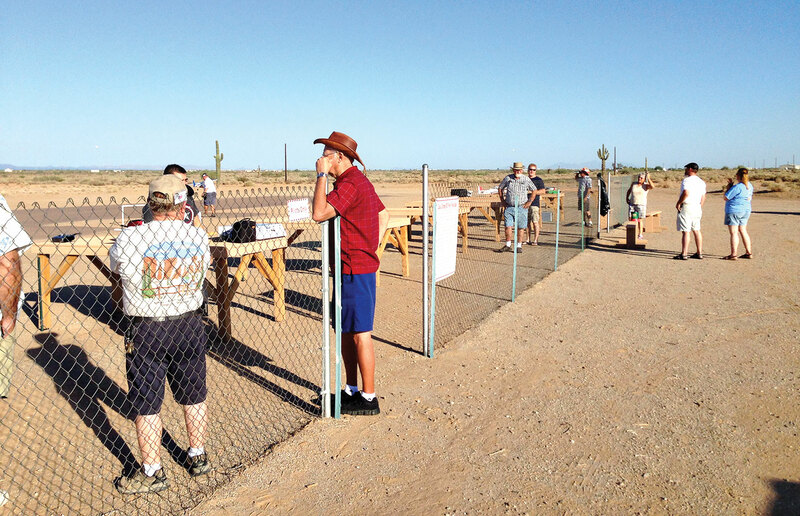 Membership in the Casa Grande RC Flyers is open to anyone wanting to fly or learn to fly radio controlled aircraft regardless of their residence. Free lessons are offered by any of eight AMA certified instructors. The first year club dues are $40 per calendar year, and renewal dues are $25 annually. Membership in the Academy Of Model Aeronautics (AMA) is required because AMA membership provides the pilot with the required insurance coverage. Details about both the AMA and the Casa Grande RC Flyers are on the club website as well as a list of all club activities and other area AMA club activities. Club members also receive discounts on purchases from area hobby suppliers when their membership card is presented. The Casa Grande RC Flyers is an Arizona non-profit corporation dedicated to sharing the joy of flying with the public and giving back to the community by supporting worthwhile charities. For more information about the club contact Alan Friedman, the club president, at his Robson Ranch home or visit the club website: www.CasaGrandeRCFlyers.com.